RCMP say the body of a man missing since January 26 was found on Friday, February 1. The cause of death is not considered suspicious at this time and the BC Coroners Service is involved in the investigation. The deceased was not identified and police say no further information will be provided at this time. On Friday morning, RCMP issued a notice that police and Castlegar Search and Rescue volunteers were looking for a missing person. 32-year-old Tyler Larstone was said to be going camping with a friend and was last seen in Winlaw on January 26. 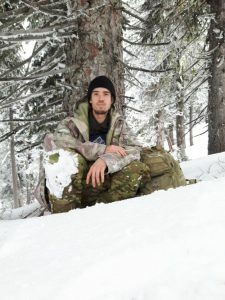 Police and Castlegar Search and Rescue volunteers are looking for a missing person described as an avid outdoors man who’s not been seen since last Saturday, January 26. RCMP say Tyler Larstone was last seen near the area of Bailey Road and Slocan River Rd in Winlaw. Larstone is 32 years old, approximately 5’7″, and 135 lbs, with brown hair and hazel eyes. He indicated that he was going to go camping with a buddy. He was last seen wearing camouflage pants, a camouflage jacket, black “balaclava” style toque, carrying a hard case camouflage pattern pack. Tracks believed to be Larstone ‘s have been located and tracked in the area of Perry Ridge. Anyone with information or who may have seen a male matching Larstone’s description are asked to contact Slocan Lake RCMP at 250-358-2222. Police and Castlegar Search and Rescue are continuing their efforts to track him through the mountainous terrain.